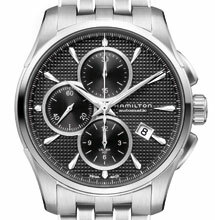 Biel, September 2012 – The new Hamilton Jazzmaster Auto Chrono uses the latest innovations in watchmaking to improvise on the proven melody represented by its original version. Driven by the recently developed H-21 movement, this high-performance automatic chronograph can rely on 60 hours of power reserve. Modernity is king in the confidently contemporary shaping of the case and the dial design. 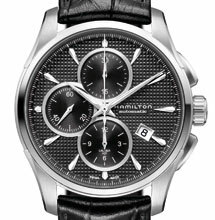 In its entirety, the Hamilton Jazzmaster Auto Chrono is a picture of sophistication that masters usability and reliability. Special shaping of the antireflective sapphire crystal enables maximum dial visibility, subtly guiding the eye to the three counters. These are grouped on the left to allow the date display at 4 o’clock optimal exposure. Tapered pushers elegantly mirror the lugs’ form and the requited love of detail also finds expression in ‘Clous de Paris’ dial decoration. 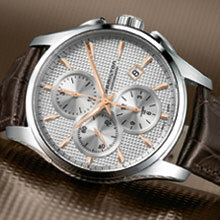 Styling choices enable the Hamilton Jazzmaster Auto Chrono to harmonize with the rhythms of diverse lifestyles. A new five-row stainless steel bracelet for instance merges seamlessly into the contemporary case. While rose gold-colored indexes bring warm tones to a version with a silver dial and crocodile-pattern brown leather strap. The five-strong family is equipped to satisfy different wearer types, united by their zero-tolerance attitude with regard to timekeeping accuracy and material quality.